Here’s an idea for you to consider: If we deeply intend to give the best to our students and teach them so they are prepared for going out into the world, what if the first ones to give to and teach is ourselves? What if, in order to take care of others, we must first take care of ourselves? And in taking care of ourselves, we automatically promote and influence positive change around us. This is not necessarily a new idea. I’m sure you’ve heard, "Let there be peace on earth and let it begin with me." How many people do you know whose email signature includes, “Be the change that you wish to see in the world.”? But how do we take care of ourselves such that we and our young people benefit? I suggest that we develop a positive, Growth HEARTSET in ourselves so that we can support those we teach in developing theirs. Most people are familiar with the idea of a mindset- a frame of mind that has a significant correlation to one’s motivation, effort, and approach to life’s challenges. HEARTSET is a frame of heart. Have you ever walked into a room or a group, where listening to different points of view is the norm? Where mistakes are tolerated and understood as part of a learning process? Where support and encouragement is common among people? Where there's joy, acceptance, consideration, and kindness? Where love is felt and shared—it's in the air? It is these foundational elements of a Growth HEARTSET—that lay the nurturing soil from which the seeds of vibrant curriculum and impassioned teaching and learning sprout. A Growth HEARTSET is a kindness of heart. It establishes an energy field of self-awareness, non-judgment (acceptance), peace, caring, positivity, giving, forgiving, and compassion that allows us to more freely and proactively be a force of good. A Growth HEARTSET creates an emotional environment in which we and the young people we teach can flourish in spite of the uncertainties and challenges that are so prevalent today. 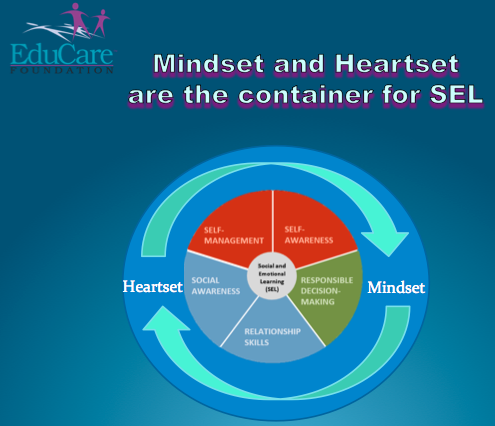 Recently, after one of EduCare’s ACE (Achievement and Commitment to Excellence) students success programs that promote Growth HEARTSET, a high school principal shared, "Well, you've opened my students’ hearts and now we can capture their minds." He recognized that when the heart is “set” in a healthy and compassionate place, the mind is more open and prepared to learn. How do we create a Growth HEARTSET? We can set or reset the "heart" through self-awareness, a clear intention, and practicing habits of a Growth HEARTSET. There are many effective teaching approaches and ways to assist you in moving along that trajectory that will be the subject of subsequent blogs and articles. By creating a Growth HEARTSET—first in yourselves so it infuses your relationships and teaching—a greater “field” or culture of caring and loving can be known, felt, and shared. This Growth HEARTSET then serves as the foundation for effective teaching and social-emotional learning (SEL) that not only enriches your teaching experience but also captures and expands the hearts, minds, and imagination of your students. View EduCare's Program Impact infographic here. Stu will be leading a Speaker's Forum on Growth Heartsets in Fresno, CA (April 18, 2018) and Modesto, CA (April 19, 2018). 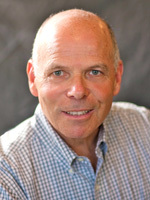 Stu Semigran is the co-founder and president of EduCare Foundation and the executive director of EduCare’s ACE (Achievement and Commitment to Excellence) Student Success Program. Currently serving more than 45 high schools and middle schools in Southern California, EduCare also is the grant manager for the ASSETs after school programs at 17 LAUSD Beyond the Bell high schools and 1 middle school. Over 30,000 students are served each year through EduCare afterschool and youth development programs. Stu’s book, Making the Best of Me: A Handbook for Student Excellence and Self-Esteem is used in schools worldwide. He currently serves on the CA Department of Education Expanded Learning Division’s SEL Planning Team and LAUSD’s Beyond the Bell’s “Take Action Campaign” Steering Committee. In 2012, Stu was recognized as a David Chow Humanitarian Award Foundation recipient for his service to youth.